Kiev is the capital city in Ukraine and being the capital it has some amazing things to see and do. Kiev is known as one of the most beautiful cities in Europe. Ukraine is full of monuments park's cathedrals, castles and other places of interest, here is a few of them from Kiev. The city is the center of Eastern Orthodox Church where pilgrims from all over Ukraine and abroad come to offer up prayers in ancient Golden-domed cathedrals, churches and majestic monasteries. These unique monuments of high-spiritual aspirations, talent and consummate skills of people born at this land are rightfully claimed as masterpieces of ancient Rus and Ukrainian architecture. Today, Kiev is a modern city with over 2.5 million inhabitants, it is a melting pot of the old styles and habits, standing in stark contrast to the birth of democracy and its effects on society. The new Kiev can be seen in everything from the buildings to the shops and stores to the people themselves. Even Kiev's "downtown" is a dotted picture of new and emerging, modern buildings against the pale yellows, blues and grays of the older architecture mostly soviet style. With Ukrainian independence, new changes became evident.. The Western-style new and modern buildings, hip nightclubs, classy restaurants and prestigious hotels began to open in Kiev's new vibrant center. Music from Europe and the United States began to rise on the Ukrainian music charts. Now, most importantly, with the new open visa regime, Ukraine is positioning herself as a prime tourist attraction. Kiev can seem quite foreign to the western tourist, as all signage are in Cyrillic script. It is still largely a city where very few people know English,With the Euro 2012 and the internet more and more people are learning English. For the non-Russian or Ukrainian speaker, it's quite possible to get around easily, and it is a very interesting city to explore. It never hurts to speak English. Often, a shop assistant will ask customers who can speak English to act as translators. It is advisable, however, to pick up a pocket Russian or Ukrainian phrasebook, and learn the Cyrillic alphabet, I have found the apps for phones and the electronic translators quite useful. Spend some time practising key words and phrases (e.g. 'hello', 'thank-you' and 'bill please'). Even what you regard as a feeble attempt at Ukrainian or Russian will amuse most people to the point where they become comfortable engaging in pantomime or trying out the little bit of English they know. Pick up a "Kyiv Tour Guide" map book (Geosvit books - around US$3-4), which is available at a number of kiosks or at the central post office. Basic tourist maps are available at the baggage carousel at Boryspil Airport for free. If you are spending much time in Kiev, get the matching Ukrainian version of your map, many locals have as much trouble with the version that is transliterated to Latin characters as you will have with Cyrillic. They need the version in Cyrillic. When asking for directions or setting out in a taxi, it helps to locate the place you want on the English map and then point out the same spot on the Ukrainian version. If you need more detailed tourist info visit Tourist Info Center on Khreshchatyk 19 (in same building with metro Khreshchatyk). There you can pick up all kinds of city maps and brochures, get a free guide, join free walking tours, use wi-fi and get an answer for any question. Open: 10 am- 7 pm daily. Staff speaks English, Russian, French, German, Spanish and other languages. In general, it is very cheap to dine in Kiev by European or US standards. So long as you stay away from the places that totally pander to tourists or to the Porsche Cayenne-driving "elite", the food is great and cheap. Try the Borscht and the Mlyntzi and then try absolutely everything else. Baked goods are cheap and great too. Even the ice-cream on the street is great. An especially distinctive one is to the right from Khreshchatyk metro exit - blue kiosk with varying length of queues. Puzata Khata "Puzo" is Ukrainian for "belly," and a khata is a traditional Ukrainian hut or shack. If you're from the States this place is like Picadilli, or any other pay-per-plate cafeteria. One of the places I frequent and is popular with locals. Food is good, but almost entirely traditional Ukrainian. Two people can eat like absolute pigs here for less than $US12. You'll be full for the rest of the day, guaranteed. 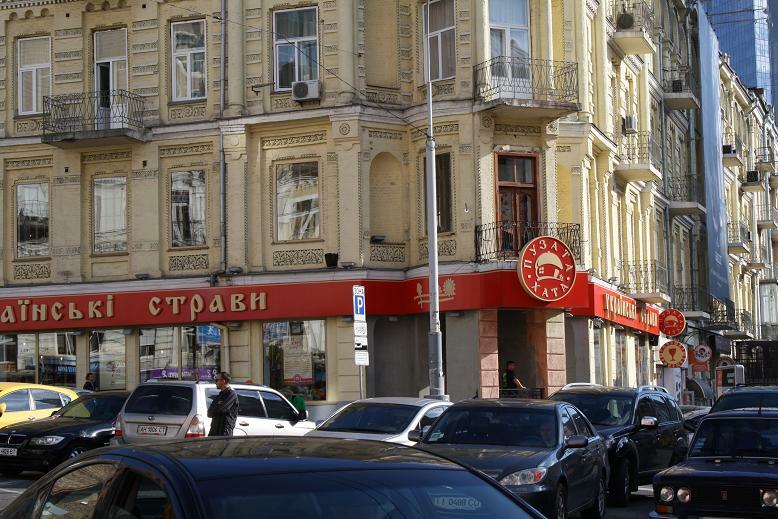 Three locations are across from Bessarabski Market; through the second arch to the right of the Khreshatik Metro station [past McDonald's, turn right through the big decorative arch]; and another on the corner of Sahaidachnoho Street, opposite Bohorodytsi Pyrohoschi (a square with a church on it). There is another one at Kontraktova Square, close to Kontraktova metro station, at the end of a downhill walk from the Andrivskyj Uzviz. They are in every major city in Ukraine. Vesuvio Pizza, 3 locations - Reytarska 25 (Рейтарська), bulvar Shevchenko 2 (Шевеченко) - near Khreschatyk (Хрещатик), and Balzak 2a (Global Shopping Centre) (Бальзака, ТоргЦентр Ґлобал). Kiev's first North American style pizza, probably the best in the city. 25 types of pizza, pan pizza and thin crust, pastas, lasagna, green salads, starting from approx. $US5 per person incl. drinks. Eat in, take out and delivery 235 6681 and 278 3028. Two Geese ("Два гуся")serves decent cafeteria-style meals. Look for the signs with two geese on yellow background. Sometimes there's a vintage car painted with their logo out front. Fast, decent, easy, all you have to do is point. No language skills needed. Domashnia kukhnia (Домашня кухня, home kitchen) offers a buffet with typical Ukrainian food. Not the best. 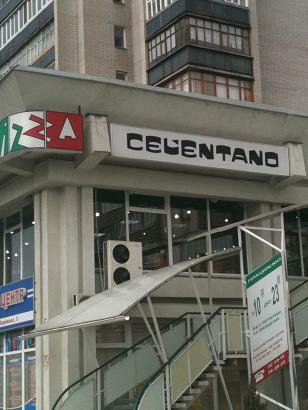 Celentano (Челентано) (pizza, salads) Not bad pizza and the salads are very good. Potato House (Картопляна Хата) chain - not really mexican but ok food. Mister Snack (містер снек) - cheap sandwich and salad chain. Also do hamburgers looks like a kiosk on the street. Viola's Bierstube (Виола) - cheap pub with a great variety of sausages and different meat meals. Also beer here is always good. (In the arc near Bessarabka). Ikon restaurant & bar, on Basseinaya str. 5a (Бассейная 5а) 380675077020. About $40/person complete. Serves fusion cuisine, unique cocktails. Open Sun-Wed from 12:00 till 01:00, Thu - Sat from 12:00 till 6:00 - party. CCCP, over the road from the entrance to the Great Patriotic War memorial. This Soviet-theme restaurant has staff dressed in traditional costume and dozens of traditional dishes listed on the English-language menu. Try the Uzvar traditional drink made from smoked fruit. Expect to spend US$10 each for lunch; they also have a US$20 business lunch menu. It would be possible to spend a lot more though. Live traditional music and farm implements decorate the wall. Lola Pizza, on Lva Tolstoho (Льва Толстого). The cost of a large pizza is about 100 UAH, and is a very generous size. You can eat in the cafe area or take-away. Oliva, Druzhby Narodiv Blvd 25a (Бульвар Дружбы Народов 25а), Kominternu St 5 - Good italian restarant with delicious food, and good prices (average price fore one persone is about 100-200 UAH). And you can have english breakfast ther from early morning till 11am. Kureni, 4, Parkova Alley - wonderful national restaurant with very tasty dishes. Dinner for five persons, including different appetizers, soups, main dishes and gorilka is around €135. It is situated on the bank of the Dnepr river and in summer it is very nice to get dinner in the garden, while in winter inside the main building you can enjoy view through large windows and fire from the fire-place. all the major credit-cards are accepted. Mimino, on Spaska (Спаська). Based on the Soviet film of the same name about a Georgian pilot. The waiters are attired in '60s influenced flight attendant uniforms. Very nice Georgian food, mainly lots of meat. Good Georgian wine available also. Cost around $US40 per person, drinks extra. Metro: Kontraktova Ploscha. Chinese: There is a good one near Metro Universitet. It's called "Jiu Long", which means "Nine Dragons" (there is a fast food store upfront, but if you go through the arch, you will see an entire Chinese-style building, that's where the real restaurant is; quality is good and prices are lower than some other similarly fancy restaurants). If you don't care about price, go to "Lun Van" near Metro Teatralna. Other above-average venues (but be warned, no one who's experienced anything like the real thing will find satisfactory Chinese food in Kiev) are Mandarin on a floating entertainment complex near the river port in Podil, and Vostok which is across the road from Mandarin. HostelKyiv.com Hostel, 28 Yaroslaviv Val, 4th floor, apt. 13 (City center), ☎ 380 (94) 925-00-20 (info@hostelkyiv.com). Hotel Saturn, 2b Geroev Kosmosa Street (Kiev, 03148), ☎ 38 044 403 32 63. checkin: 13-00; checkout: 12-00. From $30 per night. Kiev Backpackers, 18 Krasnoarmeyskaya Apt. 15 (In the passage opposite of the KinoTheater Kiev), ☎ 380 96 997 8398 (bookings@kievbackpackers.com). Located in the City Center of Kiev with English, German, Russian, and Ukrainian staff. Dorm beds from 5 Euro. Kiev City Center Hostel, 5 Pushkinskaya str., 2nd floor, apt. 9, ☎ 380630418953. This is a cheap and good located hostel in Kiev city center and the first and only ECO friendly hostel in Ukraine. They have tours like (ICBM), Top Secret Nuclear Soviet rocket base and AK47 gun shooting tours. Free WIFI internet, SAT TV, beer and vodka on check-in and bed linen. Hot running water at all time (most hostels don't have this in Ukraine), two showers and two WC, free book exchange, pub crawl tours and tourist information in English, Russian, Ukrainian,Spanish, Swedish, Danish and German. Kreschatik Str. Independence Sq. Central Hostel, 5 Pushkinskaya str., 2nd floor, apt. 10, ☎ 380630418953. true hostel made for backpackers by backpackers in Kiev one minute's walk from Kreschatik Street. Hostel is in a historical tsar era building, renovated to cater for the 'flash packer.' 24 hour hot and cold water (not all hostels in Ukraine have that) and multi-lingual staff fluent in English, Russian, Ukrainian, Norwegian, Swedish, and several other languages operating a 24 hour reception. Facilities include a luxury lounge area where you can relax, have a drink, listen to music, and watch over 380 DVDs on a plasma TV with surround system, play games or just read books and magazines. Also provide free maps, tourist info and guides and free tea and coffee all day. Magic Bus Hostel Kiev, 31 Saksaganskogo str., 2nd floor, apt. 3, ☎ 38097-336-03-03. Cozy and welcoming hostel in the heart of Kiev. Walking distance to the main street Kreschatik and railway station. Uniquely designed room. Professional & friendly staff. Really Central Hostel, 10, Bogdana Khmelnitskogo, Floor 2. Apt. 50 (access via second courtyard) (at the city centre), ☎ 380 982 636506, . Very friendly, one communal dorm, two private twin rooms. English speaking staff, wi-fi and communal kitchen. St. Sophia Hostel Kiev, Appt. 2, 2 Georgievsky lane (City center), ☎ 380 93 642 3006 (st.sophia.hostel.kiev@gmail.com). Located in the very centre of Kiev in a quiet green area, St. Sophia Hostel provides a view on Sophia Cathedral, a unique object of UNESCO World Heritage. The Hub Hostel Kyiv, Tereschenkivska Street 5A, ☎ 380 44 229 12 66. A hostel in a freestanding building in the center with a huge yard. Privates and 4-12 bed dorms, including female only dorms; free wi-fi, linen, tea and coffee. A 24-hour reception, free lockers. Big, soundproof social area with variety of board games, movies and books, well-equipped kitchen. Different activities every day of the week: movie nights, guided tours, pub crawling. Can accommodate groups and provide lodging for all sorts of events. TIU Kreschatik, 8b Kreschatik Apt. 11 (On the Main Street next to the Independence Square), ☎ 380 66 932 3676. Fully equipped kitchen, free Wi-Fi internet access, friendly English speaking staff, common rooms with big-screen TVs and DVD libraries, private rooms, frequent pub crawls, security lockers and digital coded front door locks. Dorm beds from 10 Euro. Diplomat Hotel, Zhilyanska street 59. The apartments offers fully renovated classic single and double rooms, each with ensuite facilities, including plated breakfast. All of the accommodations come equipped with individually controlled air conditioning, heating, desk, safe deposit box, mini bar, hairdryer, double glassed windows and satellite TV. From $100. Apart Hotel (apart hotel kiev), 24B Mykhaylivska Street, ☎ 38-067-403-6030. checkin: 12:00; checkout: 13:00. Fully serviced self-catering apartments in Kiev downtown. Studios, one and two-bedrooms. Airport transfer and lots of additional travel services. From EUR55 to EUR90. Hotel Kozatskiy, 1/3 Mihaylivska Street (Kiev, 01001), ☎ 38 044 279 49 14, . checkin: 13-00; checkout: 12-00. A 3 star hotel in the city centre (Independence Place). From $70 per night. Hotel Lybid'. The Hotel Lybid' is a standard European hotel. It is a short Subway or Shuttle ride from the city center. $115. President Hotel, Hospitalna Street 12. The President Hotel is a 4 star hotel with 325 rooms and 13 suites set out over 10 floors. Situated close to the city centre is in a cultural and historical quiet green area of Kiev. With your choice of either the fitness centre, leisure centre or health club. From $130. City Park Hotel, 20-A, Vorovsky Str., ☎ 38 (044)503-7790. A new boutique hotel located in the cultural, historical business part of Kiev. Hotel Rus, Hospitalna Street 4. One of oldest hotels in the city. Rooms are ok, but wear and tear is obvious and service is good. From US$183. Hotel Tourist, 2 R. Okipnoi St., Kyiv, Ukraine, 02002 ”). (metro station Livoberezhna). Rooms are good, but service is Soviet. Especially breakfast. reception ok, english speaking. Bring your own teabags or instant coffee. 29 floors.Restaurant with english menue. Close to Metro, market and shopping centre. Overlooking soviet style housing flats, view on city from 3 km away. strange bath tube. From €60. The Premier Palace Hotel (The Premier Palace Hotel). A nice 5-star hotel in a historic building. From $500. First-time travelers to Eastern Europe often struggle where to go: Moscow or Kiev. While Moscow lures with Russias rich history, spy stories and gruesome geopolitics, Kiev seems to hold a silver medal earned in the post-Soviet competition for tourists. While both capitals deserve a trip, there are three reasons why Kiev should come first on your agenda. Most Western tourists do not need a visa to Ukraine while Russian embassies abroad will grill you with questions before stamping your passport. Secondly, Kiev is three times cheaper than Moscow. And last, but not least, its eclectic mix of Soviet history and European vibe in people and architecture offers a soft introduction to Eastern Europe before you venture north to see Lenin's mausoleum. Founded in 862, Kiev is renowned for its beautiful - sadly often crumbling - buildings and streets. In the center, the architecture ranges from neo-Baroque, turn-of-the-century mansions to sporadic Soviet-built boxes losing their tiles. Modern glass high rises occasionally demonstrate that Kiev reached the 21st Century, but luckily not often enough to forget that you are in the cradle of Slavic culture. The capital is small enough to walk around the center, yet big enough to be interesting. Start off on Khreschatyk Street, the city's main artery, where pedestrian traffic replaces cars for the weekend. Elegant, neo-classical buildings lined by chestnut trees were rebuilt after World War II as they were completely destroyed by the retreating Red Army in 1941. For breakfast, stop into Passage, an alley off the small, glitzy street, Khreschatyk, right before you hit Maidan Nezalezhnosti, or Independence Square. The public space propelled Kiev to international fame during the peaceful Orange Revolution protests in the winter of 2004 amid the rigged presidential vote. At the far end of Passage, sit down for what is arguably the best cappuccino in Kiev in the elegant Wolkonsky café. Like in many Ukrainian upscale food venues, the menu is a concoction of European dishes. Order a traditional Ukrainian breakfast of syrniki, small pancakes made of curd cheese served with jam or sour cream. It makes the locals get up before noon for a perfect start of the weekend. The center of Kiev being refurbished, includes buildings restored and redecorated, especially on Khreschatyk Kiev's main street as well as on Independence Square. Many historical areas in Kiev, such as Andryivskyi Uzviz, have become popular street vendor locations, where one can purchase traditional Ukrainian art, religious items, books, game sets (including marvelous chess sets) as well as jewelry like an outdoor market with a Ukraine twist. To get to Kiev from Borispol take the bus just outside the airport cost is 25 UAH to the train station. From there you can take the metro (subway) to any place in Kiev. Vokzalna station is only 3 stops from Kreschatyc on the red line. If you are afraid of swimming in the Dnipro River, a giant water park opens on July 15 in the Dream Town shopping mall in Kyiv. The park, called Dream Island, will feature 14 water slides and five pools, each with a special theme. In addition, there will be nine types of saunas, including some exotic ones, like Indian or Egyptian. Covering 24,000 square meters, Dream Island is set to become the largest park in Ukraine, overtaking Terminal in the Kyiv suburb of Brovary by some 4,500 square meters. The owners say the complex has a capacity of 3,500 people and promise that there is much more to the park than just traditional water fun. Various parties will be held at weekends, where the visitors will even be able to set up tents near the pools and sing songs to a guitar. Dream Town in Obolon – opened Oct. 22 at the head of the pack. The mall, developed by “Stolitsa” Corporation, offers the biggest area and greatest number of shopping venues and entertainment offerings under one roof. The whole Dream Town complex includes two giant buildings, 80, 000 square meters each. One of them runs right down the middle of Obolonsky Prospect, from Obolon metro station all the way to Minska. The second stretches between Minska and Heroyiv Dnipra. The two complexes are to be connected with an underground passage. Only one of the two parts of Dream Town is open so far (the Obolon-Minska one), and it’s the one dedicated to fashion shopping, entertainment and recreational activities. The second part will open next year and feature furniture stores and various household goods. After you’ve appraised the size and scale of Dream Town, the next thing to impress will be its design. The long three-level construction with tiled floors, high ceilings and wide passages is divided into blocks by five staircase-atrium's, each lusciously decorated after a certain place on the map. If you enter from the Obolon side, you will find yourself in front of the Hollywood-style atrium. Even before you read the name “Hollywood” running across the construction in big letters, you can easily guess its theme as you look at a several meter tall dinosaur standing proudly on the ground floor. There is also King Kong hanging by the skyscraper-elevator shaft, Oscar statuettes standing here and there and numerous pictures of Hollywood stars. If you proceed along the mall, the next atrium you will come across is dedicated to Brazil. The pictures on its inner walls depict the nation’s legendary Carnival, while the rest of the place is a complete jungle. As you watch the giant boa constrictor and rope ladder spread between the sides of the atrium, you almost expect a Tarzan to jump at you from anywhere. Palm trees, exotic birds and a waterfall at the bottom completes the sensation. Next in line is Chinese atrium painted in bright red, green and gold. Elevator tower is encompassed in a bamboo construction. At the bottom is an altar-fountain with a statue of Hotei – the Japanese god of luck. Other colorful decor elements are shapes of pagoda roofs, red lanterns, tall vases with Chinese ornaments, dragons, and big fans adorning the sides of the escalator. Greek atrium has the classiest look of all with a marble staircase, pots with grapes growing from them, Ancient Greek black-figure paintings, Greek statues and bas reliefs. On the ground floor of the atrium, a Neptune statue stands in the middle of the beautiful fountain. The last atrium is themed after Paris. It’s plain to see from the Eiffel tower model on the ground floor and elevator shaft shaped as a Notre Dame de Paris. The famous Notre Dame gargoyles protrude from all sides of the atrium. Other parts of the staircase resemble beautiful Parisian gardens with classical statues and neatly trimmed small trees. Once you’ve reached “Paris,” you’ve seen all of Dream Town – or at least one of its floors. Apart from Veshchichka and few other shops, the third floor is most entirely dedicated to entertainment, recreation and dining – its ceiling is especially high, painted in blue and white to resemble the sky. There you’ll find a roller rink – a rollerblading ground (Hr 40-60 for grownups, Hr 35-50 for kids per hour); “Ice Dream” skating rink (Hr 30-50 for adults, Hr 20-30 for kids per 45 minute session) with a curious lighting system – colorful disco lights are combined with large pieces of shiny transparent fabric to create the Northern Lights effect; and separate ground for practicing curling (Hr 800-1, 000 per hour). The area next to it is designed in “wild west” style. It has a green platform for mini golf (Hr 30-50 for grownups, Hr 20-30 for kids per hour) – little hillocks and ponds on its surface create an illusion of a natural golf ground; “Ugly Coyote” (actually spelled “cayote”) shooting gallery and, of course, a saloon-bar called “At Baby Sue’s.” To allow you conveniently engage in any of the sports offered, there are several cloak rooms and changing rooms. As for food and drinks at Dream Town, you have quite a few options. Above the rink, the “Ice Cafe” is located, its rails hung with “icicles.” Plus there are two bars with tables placed along the sides of Roller drome and the ice-skating rink. 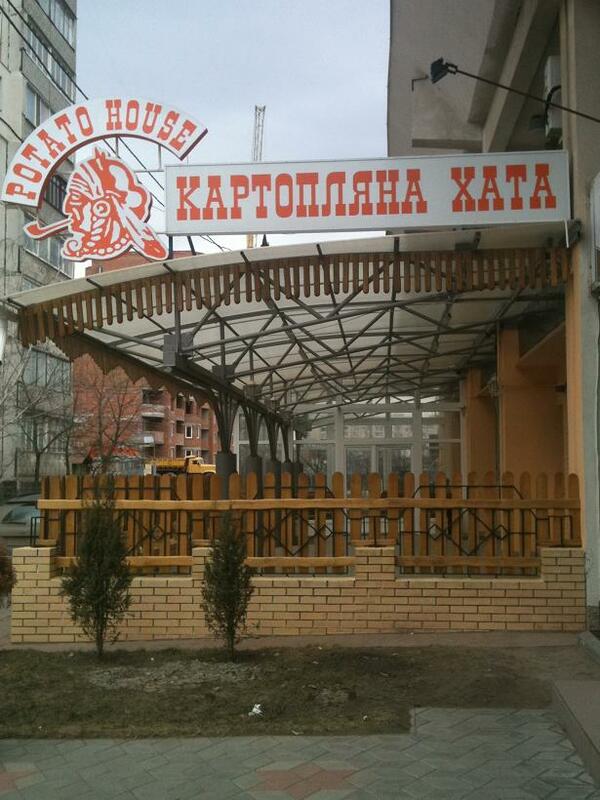 Fast food selection includes: Potato House with its separate sitting area, Shashlik Mashlik, Only Spoons (serving all kinds of soups), Yapona Khata, Pechena Kartoplya, Pizza di Favola and other places. For a more intimate dinner, go to Shakherezada restaurant, designed in rich oriental manner. Vitamin chain bowling alley, Liniya Kino cinema and Novus supermarket promise to open up soon at Dream Town. Among additional services offered at the mall, there are several Express Manicure spots and a few mini-bars offering fresh juices. The most remarkable of the latter is Jumbo Shake serving smoothies of juices, fruit and yogurt, milk shakes, fresh juice cocktails and more – over 40 different drinks on the whole. Only three of the city's public beaches, Dytyachy (Children's) in Hydropark, Chortoriy in Druzhby Narodiv Park and Veselka on Veselka Lake , received sanitary passports from city epidemiologists this month. On the other hand, it's quite an achievement compared to the last few years, when none of the beaches got any certification whatsoever. The sanitary passport certifies that a beach is clean, disinfected and treated against ticks. It has drinking water fountains, showers, changing booths, garbage bins, first aid stations and toilets. A few more public beaches are still awaiting this certification, but so far it's just these three. The Kiev City Administration, however, announced that a total of 12 beaches opened for fun and play on June 9 2010. Apart from Dytyachy, Chortoriy and Veselka, these include Sonyachny on Sonyachne Lake, Pushcha-Vodytsya on the Horenka River, Verbny on Verbne Lake, Central Beach on Trukhaniv Island, Venetian and Molodizhny in Hydropark, Peredmistseva, Slobidka and Zoloty on Peredmistseva Slobidka Island, and the Telbin Lake. Most of them, however, are still considered ,riverside recreation zones, which means if you want to go into the water, you do so at your own risk. Finally, the risk is all yours if you step onto the banks of the remaining 50 lakes, canals and ponds, which have not been combed through by doctors or ecologists. Those include Holosiyivsky, Didorovsky, Sovsky and Myshelovsky ponds, ponds in Teremki-2 area and lakes Nyzhny Telbin, Vyrlytsya, Ponomarevske, Tyahlove, Bobrovnya, Hnylusha, Kruhle, Berizka (Hydropark), Petrivske and Blakytne, basins on Bazhana prospect and others. The beach that was the first to get its sanitary permit, Dytyachy is not just for children as its name suggests (exit Hydropark metro, turn right before the Venetian bridge). But it's so well-equipped that it's safe to bring children along. It has bio-toilets for Hr 2 per visit and a free public toilet, but those are quite repulsive in most cases. Beach beds and umbrellas are available for rent for Hr 15 and Hr 10 per day respectively. The other healthy beach with a passport, Chortory is rather minimalist (exit Petrivka metro, bus across Moskovsky bridge, Druzhby Narodiv Park stop). It has only five changing booths, a public toilet and a small sports ground. However, there are also large roofed zoned to shade you from the sun, an aid station and a lifeguard base to keep you safe, and a few cafes to quench thirst. The beach on the Telbin Lake has a lot of extra features (exit Livoberezhna metro, take marshrutka No. 559, Shumskoho str. stop). Apart from 10 changing booths, three bio-toilets and a children&'s playground, there are nets for playing volleyball, basketball and football as well as tennis tables. There are no modern chaise lounges, but old-fashioned wooden beds which cost Hr 20 per day for adults and free for children under seven. There are no umbrellas for rent, but there are many trees around to keep you from getting a sunburn. Solnechny (Sunny) beach lingered in dirt and neglect for the past five years. Luckily, last month it was finally cleaned and supplied with a toilet and a sports ground. Now it also has eight changing booths, bio-toilets, and a children's playground. And for extra fun you may go for a boat ride (Hr 25 per hour) or a catamaran (Hr 30 per hour). The main benefit of the beach on the Verbne Lake (15-minute walk from the Petrivka metro) is its exceptionally clean water courtesy of the six underground springs. A thick line of trees along the bank provides plenty of shade. The beach also has changing booths, two bio-toilets, a drinking water fountain, a children's playground and a sports area. Pushcha-Voditsa is the only lakeside recreation zone in Kiev tucked away from the busy residential areas. Located on the site of a few health resorts, it boasts a rather clean beach and water. There are free beach beds (first-come, first-served) right under the trees and changing booths. You can also get a drink or a snack at the several nearby cafes and kiosks, or rent a boat or a catamaran for Hr 30-40 per hour. Hydropark's Sun City is one of the oldest Kiev beach clubs offering a paid patch of sand by day and a disco by night. It's also located closer to Hydropark metro than any other paid beaches in the same area. On weekends admission is Hr 40, the rest of the week Hr 30. The price includes a beach bed and an umbrella. When bored with swimming and sunbathing, you may go down the inflatable water slide (Hr 4 per slide) or ride a water scooter (Hr 200 for 10 minutes). R&B Beach Cafe (Hydropark metro, Venetian beach zone) technically has free admission, but doesn't allow people with their own food or drink. So what you don't pay for with the ticket, you'd spend at least on some drinking water (about Hr 20 for a small bottle), a beach bed (Hr 25) and an umbrella (Hr 10). Newly opened Kokos summer-club is also located in the Hydropark's Venetian beach area. The admission fee is roughly Hr 20, while a beach bed and an umbrella combination will cost you an extra Hr 30. The place is still under development, so a water slide, showers and changing booths have yet to arrive. Olmeca Plage has replaced Opium and UAM Beach Club this summer (exit at Hydropark metro, cross Venetian beach on foot, then walk ahead). Entrance is Hr 50, which includes a beach bed, an umbrella, and a mattress. But for Hr 200, you'll be treated as a VIP guest with an additional towel and a swimming pool. Perhaps the most luxurious riverside rest of all is offered at the new Trukhaniv complex, located on the bank of Matviyevsky bay (Trukhaniv island, on the left side of the Pedestrian bridge, 279-8029. It occupies a vast area and has plenty of amenities: a private beach, two large pools the biggest is 25 meters long, and a 30-meter-long water slide. It has everything for playing badminton, darts, table tennis, beach volleyball and mini-football. You can get it all for just Hr 100 per day. Mind the fact that the complex has conference and banquet halls, and a disco bar, so it's often closed for private events. Be sure to call first and ask if the beach and pools are open for guests. Chervona Kalyna restaurant (exit Petrovka metro, bus across the Moskovsky bridge, Druzhby Narodiv park stop) admits visitors to its small beach for Hr 50 (beach bed is included). You can also rent tennis tables (ping pong)complete with rackets and balls for Hr 70. Here we will show and tell you how the locals travel around Kiev. Most of the locals take the bus or subway to get where they want to go. Most of the buses have a sign telling where they go and the price the problem is its in Russian. The subway called the metro is also a cheap way to get around the city but it is also in Russian. Knowing where you want to go is only half the issue getting there can be difficult unless you know a little about Kiev. The city is set up in districts and each subway line is color coded so all you need to know is where to exit. On this page you will find maps of the city and subway lines. It seems signs are starting to appear in English in the metro, on a recent trip I seen a few in some of the transfer stations. Kyiv is a hilly capital with few opportunities for skiing. The Protasiv Yar complex, some 10 minutes drive from the city center, will suit the needs of both amateur and advanced skiers, as well as snowboarders, right in the city. Its crowded on weekends, so beware of clashes with beginners and long lines in front of the ski lifts. So with the slopes open until 10 p.m. and proper lighting, we advise to come here after work. You can always check the snow condition and number of people online, via the complex’s video camera. There are two slopes, both 70 meters high: One is long but flat for beginners, and the other is steep but short for professionals. You can rent all the gear right there for Hr 80-90 for two hours. A lesson with an instructor would cost Hr 130 per hour. For more adrenaline, climb inside a big rubber ball called zorb and enjoy tumbling down at your own risk. If you are looking for a total getaway, Rancho Bolivar is your place. Located 35 kilometers from Kyiv, the sprawling complex offers a variety of outdoor activities including paintball, ping-pong, hiking trails and a swimming pool. But the real draw is the horses. For Hr 150-200 an hour you can walk, or gallop, through the fields and forest surrounding the stables. Trainers are on hand if you want lessons, but you should book in advance. It is also possible to book carriage (Hr 500 per hour) or winter sleigh rides (Hr 200 per 30 minutes). The décor in Bolivar’s bar and restaurant – dark wood paneling, white tablecloths and chandeliers – resembles an upscale hunting lodge. You can dine here or choose a spot on the large wood and stone patio that surrounds and extends over a small lake. The restaurant boasts an extensive menu, but for a simple lunch the borscht (Hr 30-60) is excellent and the vegetable salad (Hr 30) is very fresh. If you prefer something fancier, everything from shashlik and grilled sausage to blini with caviar and foie gras is available. If you would like to make a weekend of it, Bolivar’s hotel has rooms for Hr 400-600 per night. The Dergachov Family Club is more rustic than Bolivar and, surrounded by acres and acres of green farmland, it is the best place for nature lovers. Some 40 horses are available to ride by the hour or for monthly lease. A trail ride in the forest costs Hr 300 for one person plus a trainer and Hr 150 for each additional person. A lesson in the ring is Hr 170 per hour or you can purchase 10 lessons for Hr 1,500. The club opened just last month and also offers a hotel and restaurant. For lunch or dinner, your best bet is the fish from a lake on the property. The carp – lightly fried and served on a wooden plank – is excellent for Hr 69. If you would rather cook your own, you can purchase a day pass and catch up to three kilos for Hr 150. For fishermen or riders too tired to make the trek home, a 14-room hotel is located above the stables. Each room has a private bath, shower and air conditioning for Hr 300 per night. The most basic of the three, and also the easiest to get to for Kyivans, Argamak is located on Trukhaniv Island in central Kyiv. You won’t find any fancy extras here – just horses. A lesson with a trainer is Hr 200 per hour or you can pay Hr 800 a month for eight lessons. They require that you are trained before going on trail rides, so you must take lessons in their outdoor riding ring first. Be sure to call in advance if you want to book a lesson. There is no restaurant on the premises but a slew of cafes and kiosks are steps away on Trukhaniv’s beach area where you can relax and take a dip in the Dnipro after a hard ride. To get there: Take the #303 shuttle bus from Lybidsky Metro station to Vasylkiv (the last stop). From here, take a 10-minute cab ride to Bolivar or catch the #1 bus to Kalinka and get off at Petrivka. Bolivar is a one-kilometer walk from the bus stop. Ask the driver to let you know where to get off. To get there: Driving is the easiest way, but if you need to take public transport, catch #313 marshrutka from the Vydubychi metro station headed to village Ukrainka. In Ukrainka your best bet is to hire a taxi for the 10 minute ride to the stables. To get there: From Poshtova Metro Station, walk over the footbridge and past the entrance to the beach. You will see some small cafes on your right and just after, a narrow dirt road leading into the forest. Follow this for a few minutes and the stable will be on your left.